Habitat destruction is the leading cause of species extinction today *1. The forces that drive habitat destruction and fragmentation are largely due to human actions through harvesting of natural resources for industrial production. Examples of this are mining, logging, trawling, urban sprawl and, most destructive, agriculture. 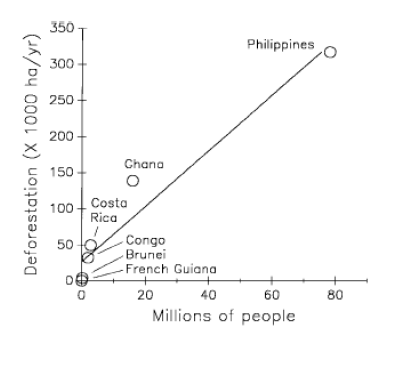 As the human population has grown, so has the need to provide food and lifestyle for that population. Agricultural activity has dramatically altered our planet’s land surface*2 and nowhere is that more obvious than in the tropics. One of the most famous examples of human population growth leading to species extinction is of the Javan tiger (Panthera tigris sondaica). This subspecies of tiger once flourished on the island of Java, found nowhere else in the world, the population began a steep population decline as the human population grew. Habitat loss from agricultural development and urban/village growth reduced the Javan tigers’ range, constraining the population to remote forests and mountains by the 1940’s. Competition for shared prey species often resulted in direct hunting and poisoning of tigers, decimating the population even further. Once so abundant that they were considered pests in some areas, an estimated twenty to twenty-five individuals of Panthera tigris sondaica remained by the mid-1950's. In 1980 the World Wildlife Fund (WWF) and the International Union for Conservation of Nature (IUCN) published a management plan for the Javan tiger in Meru-Betiri reserve, a rugged area in southeastern Java. At the time of the report, there were no more than four or five individuals left of the wild population *4. It is believed that the Javan tiger went extinct shortly after this, though the exact time of extinction remains unknown and unconfirmed sightings of tigers still occur in Meru-Betiri National Park today. Habitat loss is just one side of a double edged sword. Even today, if a few remaining Javan tigers exist; the small population and range, constrains them from rebounding successfully through lack of abundant resources and increased inbreeding. 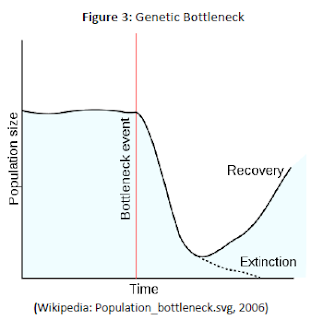 As a species’ population decreases, so does the genetic variability and with that goes the future health of a population; when this happens a population genetic bottleneck occurs. 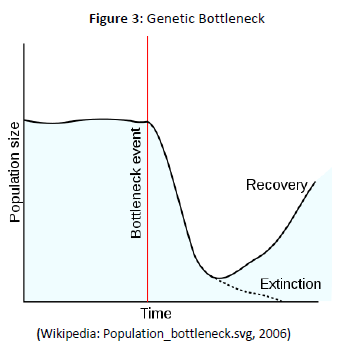 Genetic bottlenecks can also occur when the habitat range of a species is fragmented and populations are divided from each other. The industrial revolution, that was brought about by the sudden boom in human population, has caused habitat fragmentation with the development of transportation infrastructure *5, agricultural lands, and cities. These create physical barriers to species’ dispersal and can increase the rate of loss through death from vehicle strikes, human interactions, and ultimately loss of gene flow. Undeveloped regions of habitat are rare and many remaining wild species that exist in these habitats are fragmented populations. Species with highly restricted ranges are at a greater risk of extinction; this inherent weakness is the main reason that so many island species have gone extinct or are endangered *6. The minimum amount of habitat required for a population of a particular species to last in an environment is the ‘extinction threshold’ *7. As habitat declines, mortality rates increase and habitat fragmentation is believed to increase the extinction threshold for species that requires greater range of habitat to exist. Extinction threshold is affected by overall rates of colonization and extinction in a landscape and the rates of birth-immigration-death-emigration (BIDE) to a patch of habitat *7. Habitat fragmentation can lead to loss of genetic variability and possibly to the extinction of local populations *5, as in the case of the flightless violet ground beetle, Carabus violaceus, whose populations range is restricted to patches surrounded by roads and highways that inhibit the movement of individuals to neighboring populations. Migratory species, such as birds and butterflies, can be especially affected if the habitat destroyed is the home range, breeding ground, or an away point between the two. Disrupting the gene flow from migratory species in this way has been shown to be detrimental to their populations *8. Habitat destruction is a serious threat to biodiversity, the loss of which ultimately becomes detrimental to humans. The clearing of tropical forests for cultivation of crops or grazing for animal production is responsible for up to a quarter of the total emission of carbon dioxide into the atmosphere and nearly a third (1/3) of the available surface water on earth is used for irrigation *3. The loss of natural ecosystem services, that is crucial for maintaining rivers and watershed, stabilizing soils, and preventing massive erosion, is reshaping landscapes and rearranging weather patterns. If traditional agriculture was based mainly on food for humans, what do we call the new agriculture based on biofuels, cosmetics and food for livestock? Lifestyle Agriculture? Is this sustainable? Pimm, S. L. a. R., Peter. (2000). Extinction by numbers. Nature, 403, 843-844. Ramankutty, N. E., A.T., Monfreda, C. and Foley, J.A. (2008). Farming the planet: 1. Geographic distribution of global agricultural lands in the year 2000. Global Biogeochemical Cycles, 22. Laurance, W. F. (1999). Reflections on the tropical deforestation crisis. Biological Conservation 91, 109-117. Seidensticker, J., et. al. (1980). The Javan tiger and the meru-betiri reserve: a plan for management. Gland, Switzerland: World Wildlife Fund and International Union for Conservation of Nature. Keller, I. a. L., Carlo R. (2003). Recent habitat fragmentation caused by major roads leads to reduction of gene flow and loss of genetic variability in ground beetles. The Royal Society, 270, 417-423. Simberlogg, D. (1995). Habitat fragmentation and population extinction of birds. Ibis, 137(1), 105-111. Fahrig, L. (2002). Effect of Habitat Fragmentation on the extinction threshold: A Synthesis. Ecological Applications, 12(2), 346-353. Williams, B. L., et. al. (2003). Landscape scale genetic effects of habitat fragmentation on high gene flow species: Speyeria idalia (Nymphalidae). Molecular Ecology, 12, 11-20.